Mining is a cyclical business. A downturn in the gold price over the last five years saw gold exploration abandoned by the majors, and excellent projects brimming with potential cast aside in a fight for survival. However, we are now looking at the beginning of the next major gold upcycle; perfect conditions for small, swift explorers to swoop in and select the best of breed exploration assets the reactionary majors left behind. The AIM listed gold junior we’re bringing to you today — and its highly-experienced management team — has set itself up in Mali, the third largest gold producer in Africa, and one of the world’s true gold hot spots. It’s a country that is still presenting multi-million ounce discoveries to this day. The company’s management has extensive West African exploration and mining experience. The team has made no fewer than seven successful gold discoveries, over 8 million ounces in total – most of which are now being mined or are scheduled for mining. CEO Jon Foster has a 35 year track record in exploration in Africa, including helping take AXMIN to a $100 million valuation amongst many other African gold discoveries. Meanwhile, the family of non-executive director Paul Quirk was behind a £4.5 billion mining business in Africa, so it is safe to say this company knows what it is doing in Africa when it comes to building businesses and creating value. This management team is looking to repeat its past success and add at least another million or so ounces of gold finds over the coming months with this new AIM listed venture. Before we go too far, it should be noted that for political and social reasons, this is a very high-risk stock. Getting mining projects up and running in African countries such as Mali is not simple, and there may be challenges ahead. 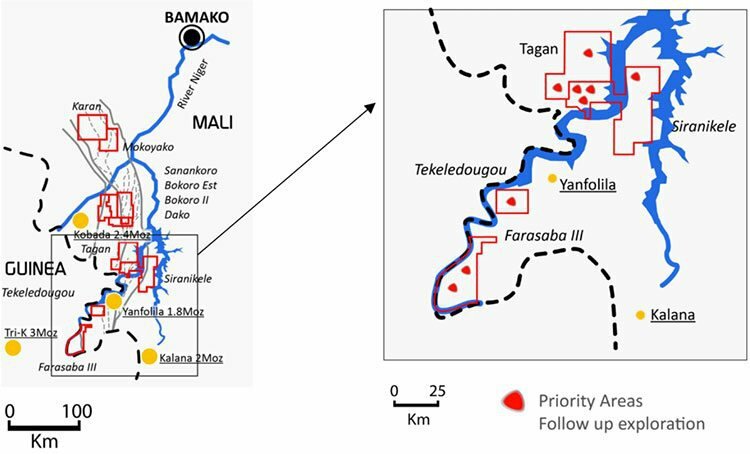 Its flagship project, the Sanankoro gold discovery in Mali has had circa US$10 million (£7.53M) in exploration conducted by previous owners Randgold and Gold Fields, which was undertaken in the previous gold boom. Now that the gold price is recovering, this AIM listed stock has snapped up the asset and is in the box seat to unlock value. The company is focused on expanding the Sanankoro gold discovery and demonstrating the potential for a multi-million ounce resource. Sanankoro is already displaying potential for immense scale, with 14 kilometres of strike length to chase. At the same time, this company will undertake exploration work to shore up other gold discoveries from its portfolio of drill-ready targets in the West African craton. There are currently six gold producing assets within Mali’s borders, and they’re operated by some big-name operators. The £6.8BN-capped Randgold Resources (NASDAQ: GOLD) is the most significant producer, delivering around half of the country’s gold output, while £472M Resolute Mining (ASX: RSG), £1.5BN Endeavour Mining (TSE: EDV), £2.9BN AngloGold Ashanti (JSE: ANG), and £2BN Iamgold (TSE: IMG) each have gold projects in the region. This AIM micro-cap stock is clearly exploring amongst giants... who may one day be looking to add to their portfolio of near term production projects. The extensive exploration done to date on its ground, combined with an impressive track record by management, all points to an excellent chance of this junior rising to the occasion and hopefully discovering West Africa’s next multi-million ounce gold mine. 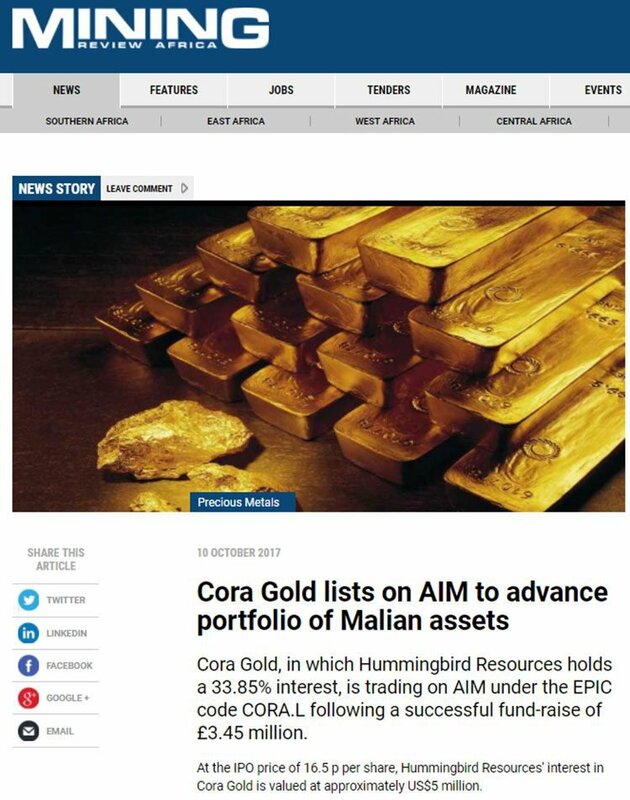 Having listed on October 9, Cora Gold (LON: CORA) is the latest junior gold explorer to join the AIM. CORA’s flagship and most advanced project is the Sanankoro gold discovery, and it is the major focus of the company’s near-term exploration activities. In short, CORA intends to prove up the Sanankoro gold discovery, and hopefully turn it into a mine – if it doesn’t get taken over first. CORA intends to define a JORC-compliant mineral resource estimate and assuming the geology continues to deliver, eventually develop it into multi-million ounce gold mine down the track. 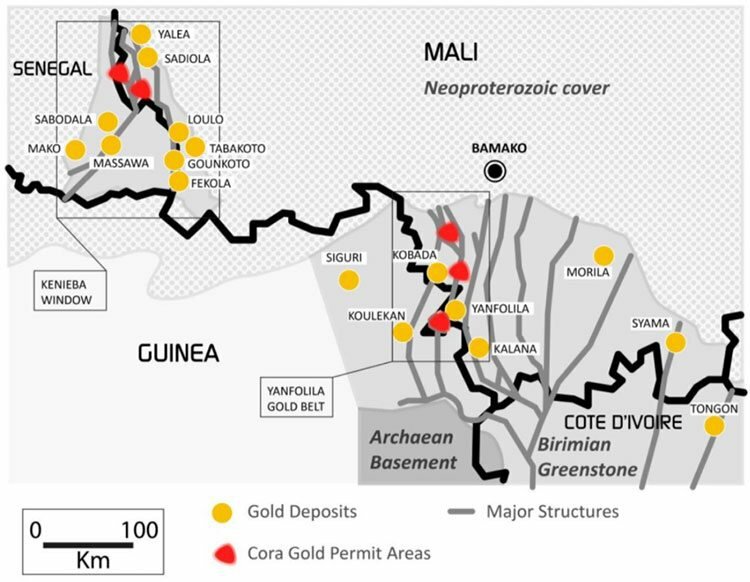 Aside from Sanankoro, all of CORA’s gold assets are located close to major deposits and producing mines, and in prominent gold districts — the Yanfolila Gold Belt in southern Mali and the Kenieba Window in western Mali. Sabodala (4.4 million ounces, owned by Teranga Gold). CORA has its near-term funding sorted and with all drilling approvals in place, exploration, chiefly in the form of a 15,000m drilling programme, can begin right away. Immediate exploration should generate strong newsflow and activity in these final months of 2017. Interestingly, the Kobada gold project – the permit next door to Sanankoro, owned by TSX-listed African Gold Group, hosts a 2.4 million ounce resource. Meanwhile Oklo Resources, a pre-resource drilling stage explorer in the area, has a market cap of around US$63 million... this is a lot higher valuation than CORA right now, and indicates the pathway for near term value appreciation. We’ll delve into Sanankoro as well as CORA’s other assets shortly, but first a rundown on how CORA came to be the AIM’s newest, and possibly most promising, junior African gold play. CORA marketed its IPO to institutions and other high net worth individuals, resulting in an impressive share registry when it debuted on London’s junior AIM on October 9. The IPO was extremely well supported by new investors, as well as by existing shareholders who took up 50% of the offer. Having raised £3.45 million, for a resulting market cap of around £9 million, CORA found itself well-funded and ready to get on with its exploration work. 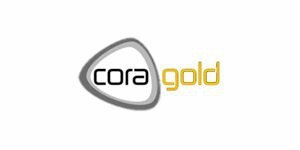 CORA allocated 65% of the funds raised to develop its Sanankoro gold discovery, with aircore (AC), reconnaissance (RC), and diamond drill programmes, which will begin before the year’s end. Drilling will focus on assessing the strike extensions at Sanankoro to the north and south, and also include some follow up drilling in the central zone where drill targets have already been pinpointed. The balance will support a simultaneous exploration drill programme of up to 10,000 metres at CORA’s other drill ready targets across Mali and Senegal. The above article summarises CORA’s listing, as well as its near-term intentions. You’ll notice that it makes mention of £132 million-capped Hummingbird Resources (AIM: HUM). 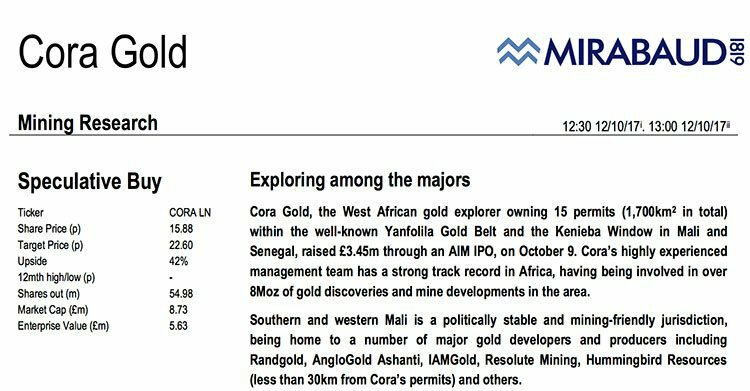 CORA will be drilling in the same Yanfolila gold belt as Hummingbird, however, the company’s ties to CORA go further than that. 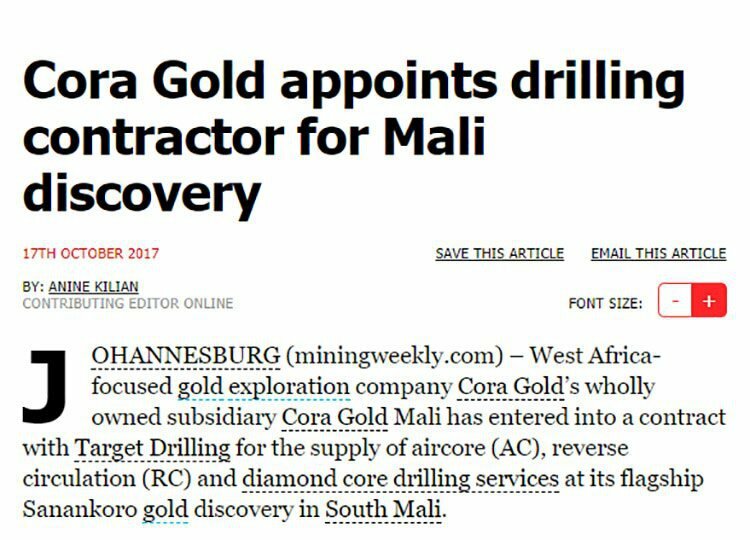 CORA was established by Hummingbird and Kola Gold to amalgamate the non-core exploration permits of Hummingbird in Mali, together with Kola’s permits in Mali and Senegal. The decision was then made to take the company public, raising funds via an IPO. In return for the assets, Hummingbird has emerged as a major CORA shareholder, holding a 33.85% interest in CORA, down from its pre-IPO holding of 50%, which was diluted during the listing. The exploration permits that CORA acquired from Hummingbird had earlier been acquired by HUM from £2.6 billion-capped South African gold miner Gold Fields (JSE: GFI). These permits had already undergone substantial drilling work and explorations. This included work at CORA’s principal asset, the Sanankoro gold discovery. Here reconnaissance (RC) drilling over a 14 kilometre zone identified two parallel and mineralised structures, each with a 14 kilometre strike length. In exchange for becoming an investor in CORA, Hummingbird sold CORA a number of its exploration interests. Some of these assets could become sources of ore to be processed at Hummingbird’s Yanfolila, presenting a clear pathway to early cash flow for the company. Sanankoro, CORA’s main asset, comprises four contiguous permits: Sanankoro, Bokoro East, Bokoro II and Dako, totalling approximately 320 sq. kilometres. The Sanankoro gold discovery has definite potential for a standalone mine development into future commercially-viable gold mine. Before then, CORA intends to prove up a minimum 1 million ounces of gold across these four permit areas. The Company believes this is a starting place, and Sanankoro has the potential to deliver multiples of this. The Sanankoro site has already been subject to substantial exploration activities, with circa US$10 million spent on the assets, including soil sampling, termite mound sampling, ground geophysical surveying induced polarisation (IP), resistivity, trenching, RAB, AC and RC drilling, and associated sampling has already been undertaken at the site by Randgold and Gold Fields, the previous owners. It was during this exploration, that RC drilling identified the two parallel and mineralised structures, each with a 14 kilometre strike length. The mineralised structures show remarkable continuity along strike and the mineralised zone is broad, indicating likely amenability to bulk tonnage mining techniques. This points to the potential for a low cost operation in the event Cora delineates a multi million ounce resource. 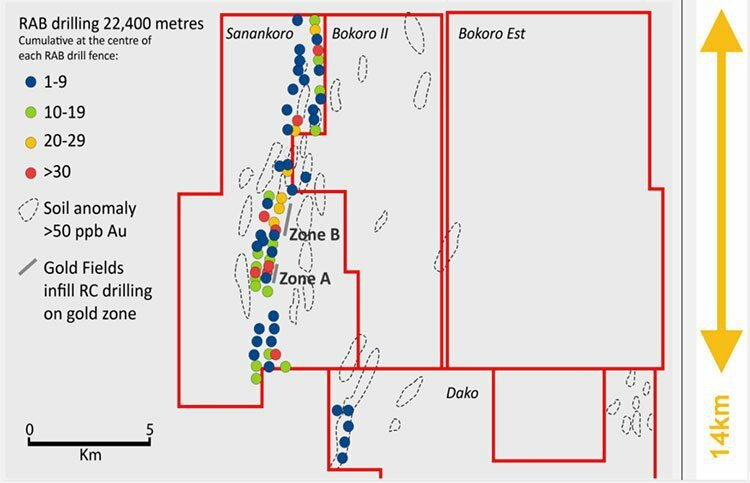 The systematic RC drilling by Gold Fields covered the entire 14-kilometre length of the Sanankoro structure and while the results demonstrated the potential for gold mineralisation along its length, there wasn’t enough data to estimate a mineral resource at the time. 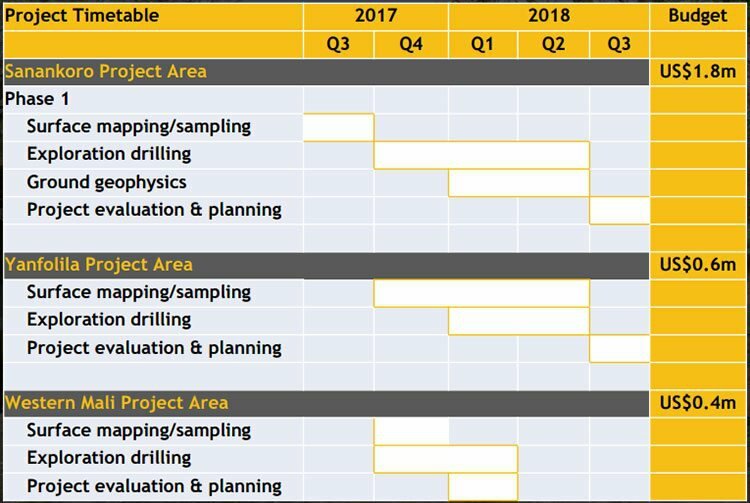 All of this past exploration is informing CORA’s near term activities – it’s basically picking up the baton from where Randgold and Gold Fields paused. 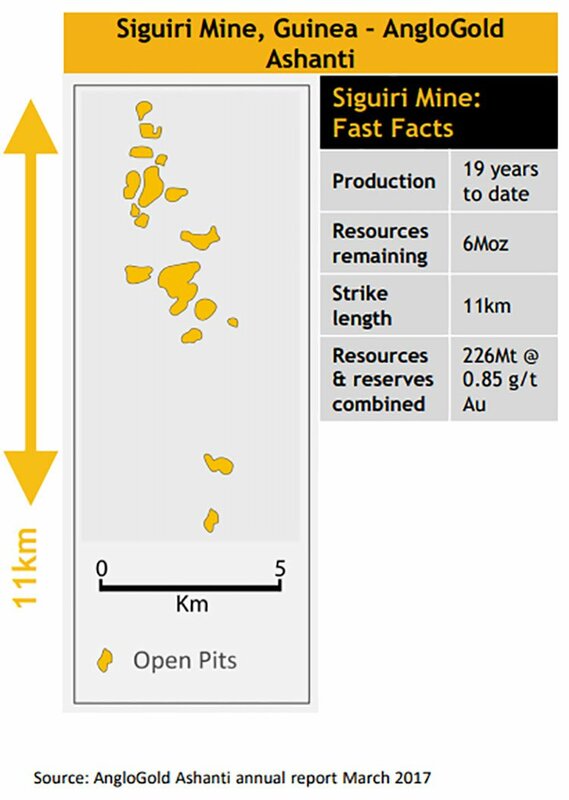 And while it might sound like an optimistic comparison, CORA’s flagship gold discovery has a comparable footprint and geology to that of global mining giant AngloGold Ashanti’s Siguiri Mine, which is located just over the border in Guinea. As at December 2016, AngloGold Ashanti reported Mineral Resources of 226 million tonnes with an average grade of 0.85g/t for total of 6 million ounces of mineral resource. In 2016, Siguiri produced 259,000 ounces of gold with a total cash cost of US$784/oz at an average grade of 0.79g/t. Gold Fields’ drilling of the 14 kilometre structure was followed up with more drilling focusing on just 1.6 kilometres of strike. Drilling highlighted broad zones of mineralisation with likely economic widths and grades, from surface to depths of at least 100 metres. This suggests that there is potential to expand the known mineralised zone with further explorations and to then establish a sizeable gold resource, minable by open pits. The Western Structure, on the other hand, has so far seen only limited drilling. There remain undrilled targets at the property, with adjacent permits underexplored too. CORA has budgeted US$1.8 million (£1.37M) for surface mapping, exploration drilling, geophysics and project evaluation at the Sanankoro gold discovery. Recently, CORA appointed a drilling contractor, Target Drilling, to deliver aircore (AC), reverse circulation (RC) and diamond core drilling services at the Sanankoro gold discovery. A 15,000 metre AC and RC drilling programme is about to commence. Following that, diamond core drilling of up to 1000 metres is planned, and is expected to begin at the end of November. The drilling programme will be phased, allowing assay results to be received and evaluated, before progressing to the next stage. This should see steady newsflow through to the end of the second quarter of 2018 when the drilling programme is expected to conclude. On top of the drill programme planned for Sanankoro, CORA plans to drill 10,000 metres on the Yanfolila and Western Mali project areas. 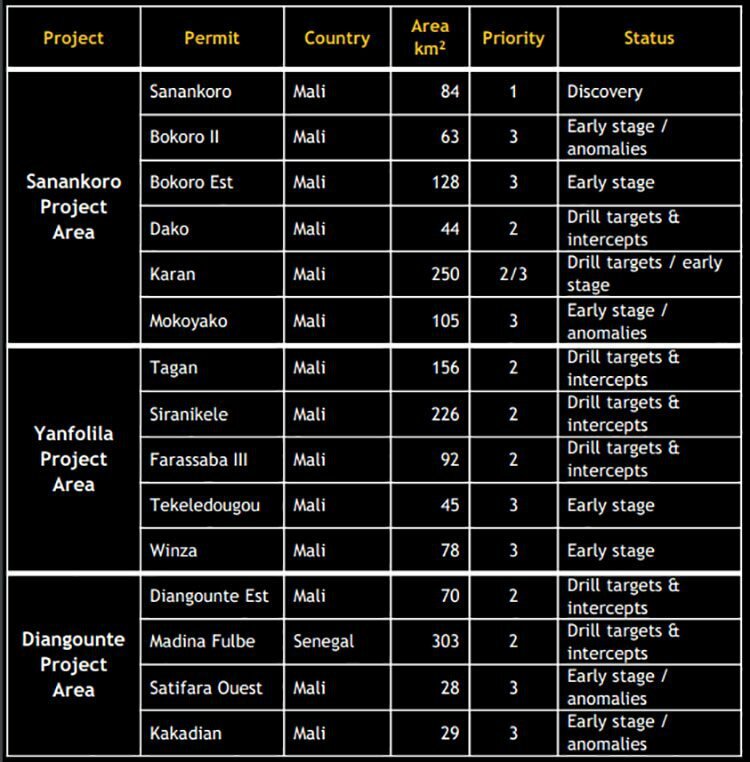 CORA has four project areas within the Yanfolila gold belt — Tagan, Siranikele, Teledougou and Farasaba III. All of these tenements are within close proximities to Hummingbird’s Yanfolila Gold Project, which is expected to produce first gold before the end of 2017. 18 metres grading 4.34g/t gold. 3 metres grading 3.08g/t gold. While this initial drill work has already found promising levels of gold, further drilling is needed to better understand the ore body. 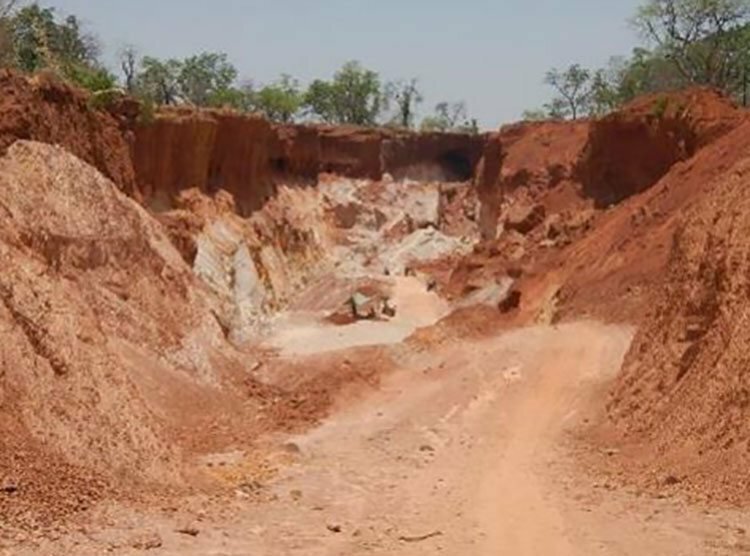 CORA will follow up on these significant intercepts in the hope of identifying resources for possible treatment at Hummingbird’s Yanfolila gold mine... and bringing about near-term cash flow. There has been only limited exploration at the Tekeledougou property, which is located just six kilometres from Hummingbird’s Yanfolila project. Although it does have evidence of artisanal workings. 6 metres grading 1.22g/t gold. 3 metres grading 3.22g/t gold. 2 metres grading 2.86g/t gold. 4 metres grading 2.60 g/t gold. The third of CORA’s exploration ambitions is in the Kenieba Window, a region which has seen extensive exploration over the past two decades with more than 50Moz of gold discovered across 12 projects. 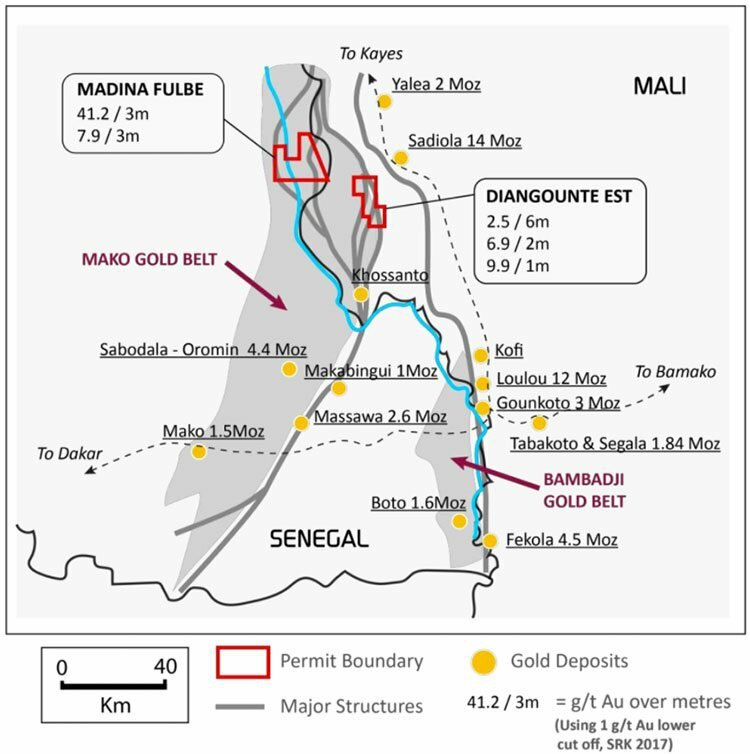 CORA will further explore its Diangounte and Madina Fulbe projects, which are in Mali, on the Senegal border. CORA sees an opportunity to generate early cash — which is quite unusual from early stage exploration projects — by trucking ore to nearby established projects. Ore from the Yanfolila project area could be trucked to and 34% shareholder Hummingbird Resources’ Yanfolila gold mine. While, and CORA’s the Diangounte project area is within trucking distance of AngloGold Ashanti-IAMGOLD’s Sadiola gold mine. Early cash flows would present an opportunity to reinvest cash into progressing CORA’s principal project, Sanankoro. While the company only began trading in October, it’s already generating positive reviews from analysts. Mirabaud Securities published a research note on the company just days after it began trading. Mirabaud analysts have tagged CORA as a ‘Speculative Buy,’ with a share price target of 22.60p — 50% upside to CORA’s current 15p share price. Of course, like any analyst target, there is no guarantee that it will eventuate – so invest with caution. In valuing the company, Mirabaud make note of CORA’s extensive land position in multi-million ounce gold regions. It also notes the company’s highly accomplished management team, and its potential for early cash flow from four of CORA’s permits within the Yanfolila gold belt and close to HUM’s Yanfolila processing plant. Mirabaud speculate that CORA could become a multi-million ounce gold explorer with the next three or so years. Beaufort Securities (which along with Mirabaud, acted as Joint Brokers during CORA’s IPO) also rated the company as a ‘Speculative Buy’. Beaufort have a 20p per share target on the stock, for an £11 million value, suggesting a 33% upside on the current price. Once again, broker price targets should not be the only piece of information used to make an investment, investors should consider a range of factors including their own risk profile before choosing to invest. This valuation was based on the broker’s estimate a non-compliant mineral resource of 1Moz for Sanankoro, based on historical drill results and an average grade of 1.5g/t. The broker used findings from previous systematic drillings, plus artisanal workings that demonstrated the continuity of mineralisation along Sarankoro’s Eastern Structure when determining the valuation. 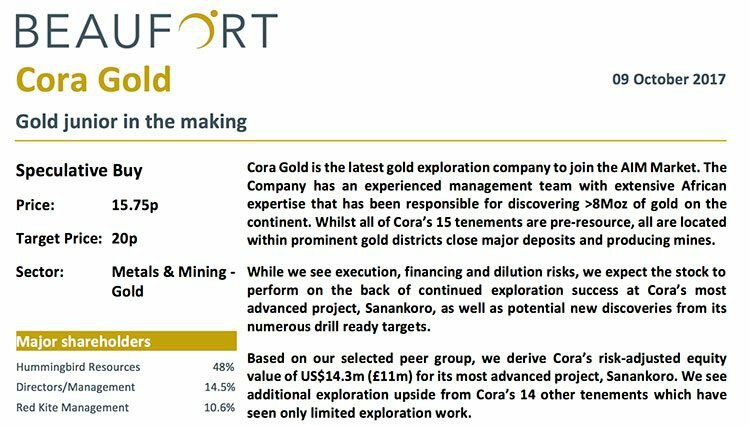 CORA see excellent potential to expand its Sanankoro discovery through further exploration. Having now appointed a drilling contractor ahead of schedule, CORA is about to commence 15,000 metres of AC and RC drilling at the gold discovery. This, along with a further 1000 metres of diamond core drilling , will continue through the first half of 2018. At the same time, the company will also drill up to 10,000 metres across at its other 14 tenements at the Yanfolila and Western Mali project areas, for a cost of around US$1 million in total. Sanankoro is CORA’s immediate focus as it works towards establishing a JORC-compliant mineral resource estimate. This discovery presents the opportunity to establish a very sizable Resource that might eventually come to be mineable. Over the coming months as CORA progress with further exploration, we can expect significant newsflow. With all approvals received, the company will be drilling before the end of the year at both Sanankoro and at its secondary tenements. Additionally, the company is progressing with drilling programs and at its secondary assets. The near-term cash flow potential of CORA’s early stage exploration projects, thanks to their proximity to processing facilities, is unusual but valuable when it comes to having funds to reinvest back into CORA’s principal project. CORA looks to have a robust future. It has a big brother in the form of Hummingbird Resources, which already owns over 30% of CORA, and could look to acquire CORA outright if the metrics stack up. CORA has another major shareholder in Lord Farmer’s Red Kite (just over 10%), a multi-billion dollar metals trading and investment firm, who could also look to fully acquire the junior explorer and develop the asset into a mine. Of course this is mere speculation at this stage, so investors should seek professional financial advice if considering this stock for their portfolio. The other option for value appreciation for early stage CORA investors is to simply go it alone and develop the mine themselves – with the management team’s extensive local networks and access to funding – we wouldn’t rule out this pathway either. In essence, CORA has a high quality gold portfolio, managed by a proven team and is exploring in the shadow of major successful gold mines. It seems the company has plenty of upside and team’s track record in making multi-million ounce gold discoveries, many of which have been developed into profitable mines, could hold up again here.